What is KLM's baggage allowance? Find out here. You don't need to be restricted by KLM's baggage allowance when going on vacation or when moving abroad with KLM. Instead you can send your luggage to your destination with Send My Bag. Find out how cost-effective it is to send several suitcases full of your things, rather than struggling with them yourself throughout your journey. 1 larger item of hand luggage, 55 x 35 x 25 cm (21.5 x 13.5 x 10 in), plus 1 smaller item no larger than 40 x 30 x 15 cm (16 x 12 x 6 in). 12 kg (26 lbs) is the total allowable weight for the two items. 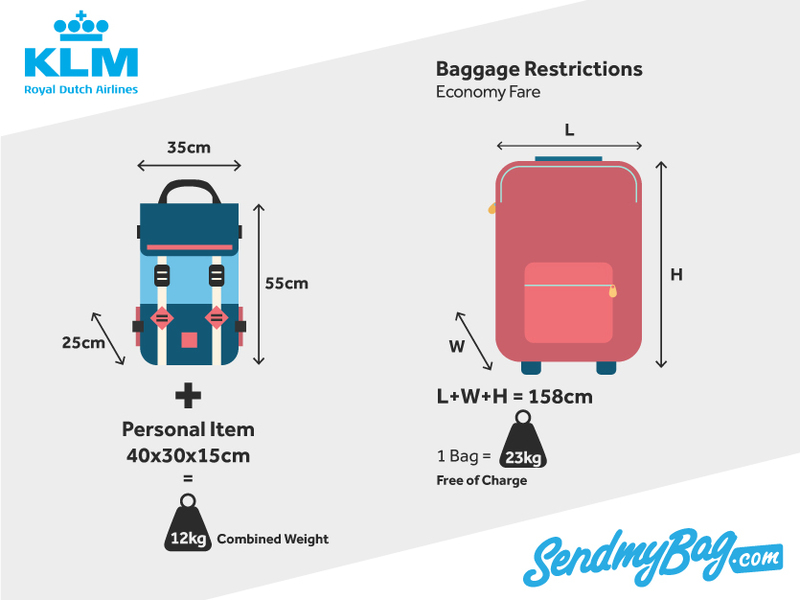 The KLM baggage allowance for Business Class passengers is 2 items of hand luggage, each measuring no more than 55 x 35 x 25 cm (or 21.5 x 13.5 x 10 in), plus one smaller item no larger than 40 x 30 x 15 cm (or 16 x 12 x 6 in). All hand luggage carried on board by Business Class passengers must weigh no more than 18 kg (or 40 lbs) in total. A small musical instrument, such as a violin, can be brought on board as your item of hand luggage. The instrument must not exceed 55 x 35 x 25 cm (22 x 14 x 10 in). An extra seat can be purchased for larger instruments, as long as they don't exceed 140 cm (55 in) in total dimensions and 45 kg (99 lbs) in weight. If travelling with a child under two who is sitting on your lap, you may bring one baby bag on board with you. This must measure no more than 55 x 35 x 25 cm (22 x 14 x 10 in) and weigh no more than 12 kg (26 lbs). You may also bring one collapsible buggy to the aircraft. Economy passengers on intercontinental flights may check 1 bag with total dimensions of max 158 cm (62 in) and a max weight of 23 kg (50 lbs). On European flights Standard and Flex passengers may check 1 item of 23 kg (50 lbs) free of charge. Economy passengers on Light tickets do not receive a checked baggage allowance but can purchase an allowance. A 23 kg (50 lbs) bag costs EUR 25 online, or EUR 35 at the airport. Business Class passengers are permitted to check in 2 hold bags, each with total dimensions no greater than 158 cm (or 62 in) and each weighing no more than 32 kg (70.5 lbs). Note that ‘Flying Blue’ club members (except Ivory level) receive additional baggage allowances. If travelling with an infant without their own seat you may check an additional 10 kg (22 lbs) bag for the infant’s things. Sports equipment may be checked as hold luggage on KLM flights. Items may not exceed 300 cm (118 in) in length and 23 kg (50.5 lbs) in weight. If you wish to check more baggage than is included in your baggage allowance, you will need to pay excess baggage fees. If only one bag is included in your allowance, you can expect to pay between USD 55 and USD 100 for a second bag, depending on the type of route travelled. Any further bags will cost between USD 200 and USD 285. Overweight items (between 23 kg/ 50 lbs and 32 kg/ 70.5 lbs) will cost between USD 55 and USD 100. Any item over 32 kg (70.5 lbs) will cost between USD 100 and USD 300 and will need to be transported as cargo. IPhone users will now be able to measure their luggage using KLM's Messenger plug-in. Messenger uses augmented reality to allow passengers to measure their hand luggage before they travel, to make sure it fits within KLM's hand luggage allowance. Looking for KLM sized hand luggage?